Michael Phelps wasn't the only athlete to prove he was a mere human today. While Phelps was finishing out of the medals in the 4x100 individual medley, three-time world gymnastics champion Kohei Uchimura—dubbed "Superman" for his dominance—fumbled through the men's preliminaries, logging two falls on his six apparatuses. The star of the Japanese team qualified for only one event final, and made it into the all-around final in ninth place. The Japanese men had been predicted to be neck and neck with China, the defending Olympic and world champions. And they were—because even as Japan was finishing fifth in the qualifying rounds, China was landing in sixth. Days before this competition began, China lost pommel horse gold medalist Teng Haibin to a torn muscle and had to fly in alternate Guo Weiyang from the team traiing site in Northern Ireland at the last minute. So first place in the qualifying rounds was claimed by the American men, with a commanding victory in the second of three subdivisions, competing head-to-head with Uchimura and Japan. Olympic Trials winner Danell Leyva topped the men's leaderboard, and national champ John Orozco came in fourth place. Overall, nearly all of the American men landed in an apparatus final. There were still mistakes, including a fall on pommels and shaky performances on rings and parallel bars from team veteran Jonathan Horton. Like Japan and China, they have room for improvement. 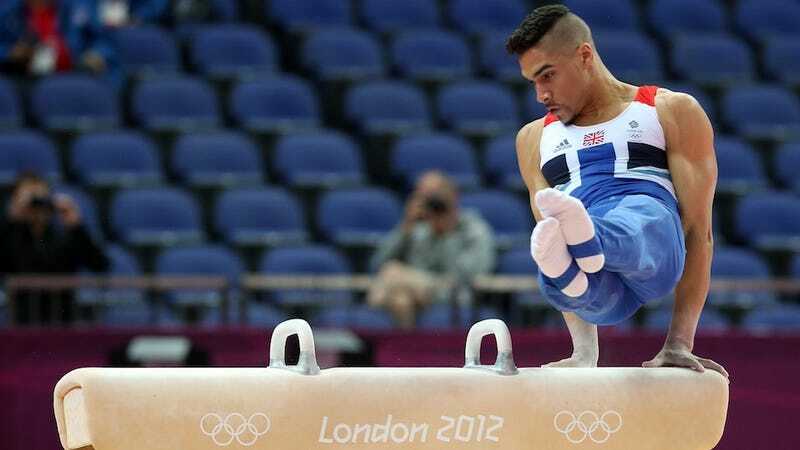 In the first subdivision, China was defeated by the hometown favorites, a British team led by Kristian Thomas and 2008 Olympic bronze medalist Louis Smith, who not only was the top qualifier for pommel horse, but has already won the coveted best "coif" title. (At least according to me.) According to a tweet from AP's Will Graves, Smith got special permission to leave the Olympic Village to have his hair properly tended to. When asked by Graves why, he responded, "I trust my barber. He knows what I want. I like to change it up but still keep it professional. I don't want to look like a blanker." I hope that if he wins pommels, he thanks his barber along with his parents and coaches. As to what "blanker" means—I have no idea (and I tried Googling it). But learning about other cultures is what the Olympics are all about. Perhaps Smith actually said or meant to say wanker, but Graves was too polite to tweet it that way. A resurgent Russia, competing in the final group, qualified in second right behind the United States. But finishing first in the qualifying doesn't mean much. The eight teams that reached the final will all start from zero again on Monday. And the team final has a different set of rules than the preliminaries. During each preliminary event, a team used four of its five gymnasts, then threw out the lowest score. So Horton's fall on pommels and Sam Mikulak's low mark on the high bar didn't count. In the team final, though, the lane bumpers are removed. Only three gymnasts go on each apparatus, and all three scores count. Falls in the final will be much more damaging to the team total.